Keep important information at your fingertips with Dialogue and Dashboard Digests. Each User can set his or her own preferences regarding Digest delivery. System Administrators do not control these settings account-wide. Sends an overview of Dialogues assigned to you or your team. You’ll see a list of all of your Dialogues, and notifications for those that are past due. 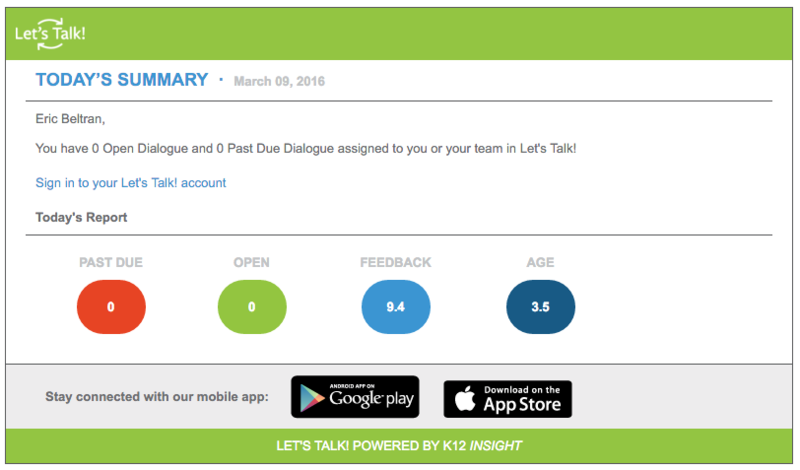 Shows a snapshot of key data from your Let’s Talk! Dashboard. You’ll always stay on top of your key statistics, and know how you stack up in your district. Digests can be found under Notifications. Navigate to Notifications either through Settings or by clicking on Notifications above the Inboxes. At the bottom of the page, you’ll find My Digest Preferences. Select the checkbox next to the Digest you would like to enable, and then select how often you would like to receive that Digest. Once you’ve selected the Digest and its frequency, click the Save button found in the top-right hand corner of the page. Log In to Let’s Talk!